I am always looking for healthy recipes to help boost my immune system. I suffer from chronic allergies and asthma and seem prone to catching colds easier than I’d like so I try and improve my health by eating clean and healthy and focusing on foods that are known to support a healthy immune system. I recently broke my wrist and am stuck resting on the couch, so I am concerned about keeping my calories down while boosting my nutrition. I do this by juicing fresh vegetables and fruits, and through soups such as this one. 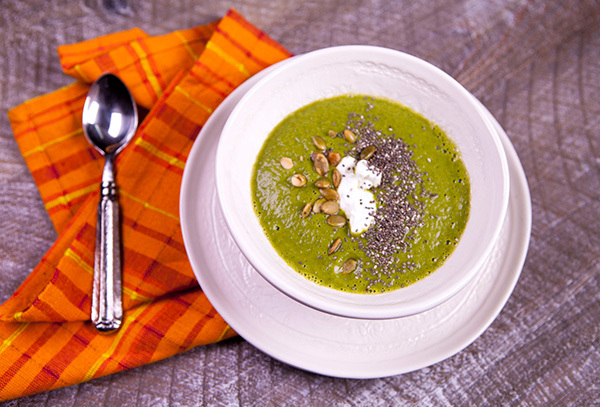 This soup combines broccoli and greens along with onions, garlic, and ginger, and is loaded with vitamins, fiber, and minerals. Best of all, it has a vibrant, fresh flavor that is delicious. I made a double batch of this soup that I then divided into individual containers that I can pull out of the freezer for lunch whenever I am in the mood. I find it helpful to have a few different healthy kinds of soup in my freezer so I can rotate them, so I never get tired of eating the same thing two days in a row. You can garnish this soup with whatever toppings you prefer. I topped mine with fat-free Greek yogurt and some chia and pumpkin seeds, but you could also top this soup with some whole grain croutons.By adding the potato, you can create a creamy soup without the addition of cream. 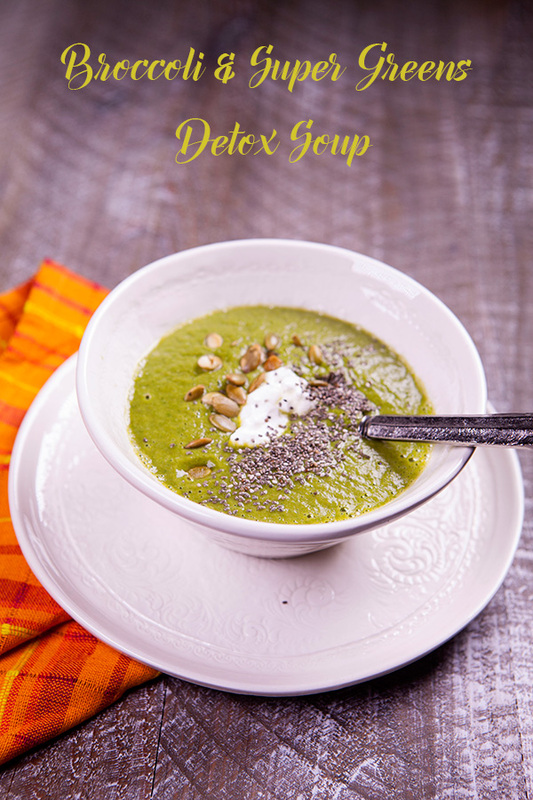 I use my Vitamix blender to create a smooth, creamy texture with soups such as this one, but a hand wand immersion blender also works well. Garlic contains the active ingredient allicin, which fights infection and bacteria. Ginger has potent antioxidant, anti-inflammatory and antimicrobial properties. It also helps to boost immune function and combat cellular damage. This gut friendly spice stimulates digestion, gut motility and bowel function, while helping to relieve bloating, cramping and nausea. Gingerols are antioxidant compounds in ginger that also have great anti-inflammatory properties. Broccoli is super-charged with an arsenal of vitamins and minerals. Packed with vitamins A, C, and E, as well as numerous antioxidants, broccoli is one of the healthiest vegetables you can put on your table. Kale packs a ton nutrition including vitamin K, lutein, vitamin C, beta-carotene, and it is even rich in calcium. Kale has a similar nutritional value like broccoli and contains sulforaphane, which is a chemical containing anti-cancer properties. In a heavy bottom stock pot, heat the oil over medium heat, then add the onions and garlic and cook until the onions are translucent, about 5 minutes. Add the broccoli, celery, greens, potato, broth, and ginger, and bring to a boil. Reduce the heat to a simmer, and cook until the vegetables are tender, about 8 minutes. Season with salt and pepper and add the greens, lemon juice, and chia seeds. Cook for another 3 to 4 minutes, then transfer the soup in batches to a blender and puree until smooth and creamy. 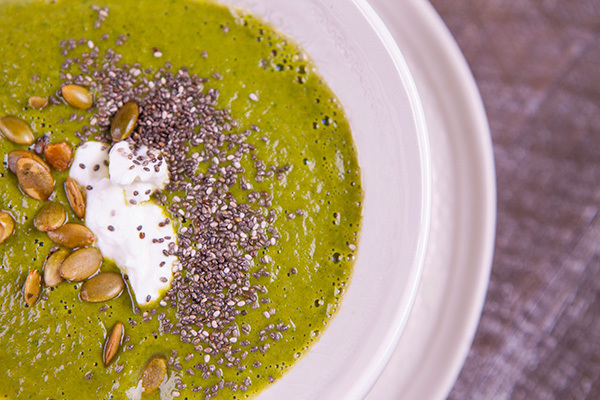 Serve in individual bowls topped with a dollop of yogurt, and a sprinkling of chia and pumpkin seeds.